Take a close look whenever you watch Nicolò Bulega in action: the KTM youngster is rarely sat properly on the saddle. Yet his unconventional posture is obviously no barrier to success. Despite being in his debut season, Bulega is causing a storm in the Moto3 world championship. Kids of today, eh? All day sat on their backsides, wasting their time on smartphones and games consoles. It’s always the same … or is it? 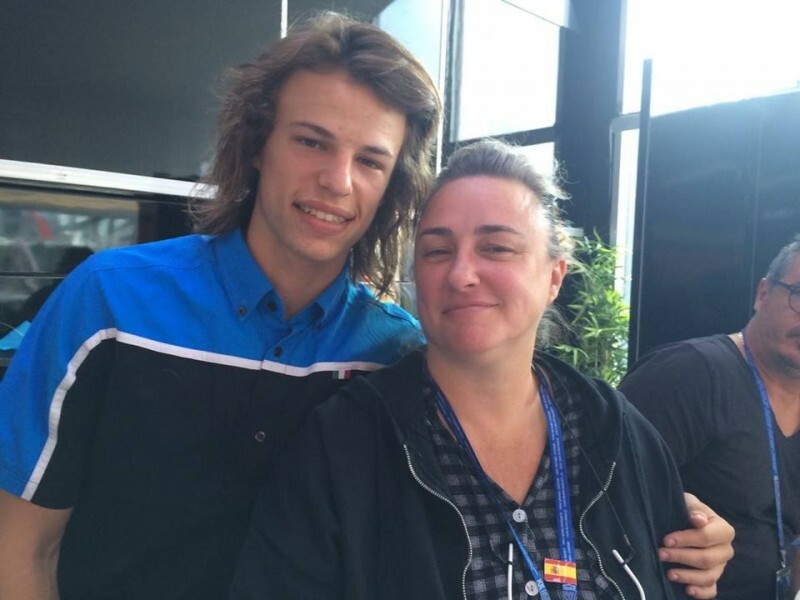 We take issue with such lazy stereotyping and present the counter-argument: Nicolò Bulega, KTM rider in the Sky Racing Team VR46 and something of a model apprentice. 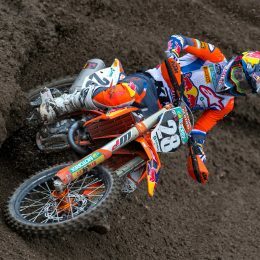 Although only in his first Moto3 season, the 16-year-old is sitting a proud fifth in the world championship rankings. Nicolò Bulega sticks his backside up in the air. More so than he would prefer, if truth be told. Unfortunately this is the only way that the rather lanky lad from San Clemente near Rimini can squeeze his 1.80 meter frame behind the fairing of the Moto3 KTM. On the straights Bulega looks rather like a jockey, constantly remaining a few centimeters above the saddle. It’s only shortly before the braking zone that Bulega presses himself back down onto the seat. Back into the next straight and it’s the same story: bottom up. His engineers can actually identify when Bulega sits back down again from the on-board data recordings – namely every time that the sensor on the rear shock absorber registers an unexplained compression. A Moto3 race for Bulega is basically a permanent case of up and down, up and down. The fact that his equally large team boss, the nine-time world champion Valentino Rossi, happily explains how his own body size was a benefit by allowing him to better work with the weight transfer on the MotoGP Yamaha, does little to help Bulega. What may help on a MotoGP machine can be a disadvantage on the smaller Moto3 KTM. This poses the question of how Bulega manages to post such quick times in the face of such a handicap. 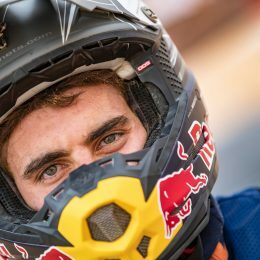 With a bit more luck and one or two fewer errors, he could have already won his first 2016 Grand Prix, the night race in Qatar. He secured his first ever pole position in Jerez, followed by the runner-up spot in the race itself. 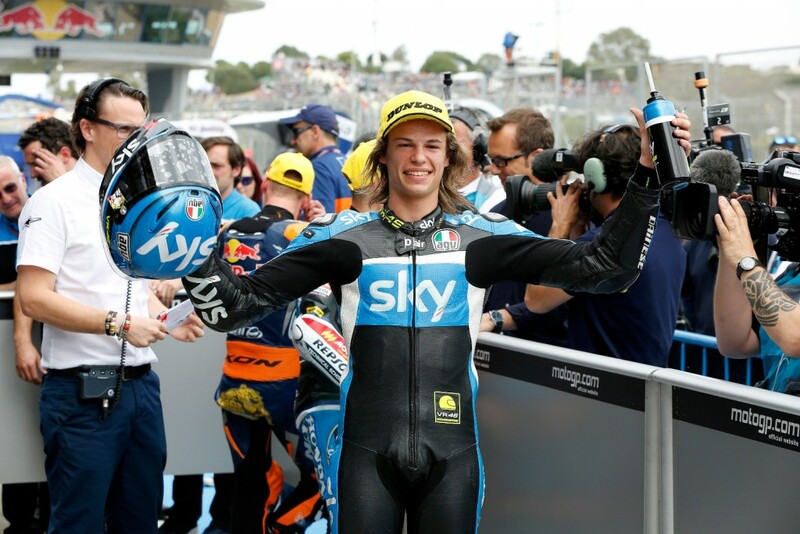 Apart from the Argentinian Grand Prix, where Bulega had the wrong setup for the wet conditions out on the track, and his failure to finish in Mugello due to a technical problem, he has finished in the top 10 of every single race to leave him fifth in the world championships. No wonder that the tabloid press back home in Italy are already waxing lyrical about the new Valentino Rossi. 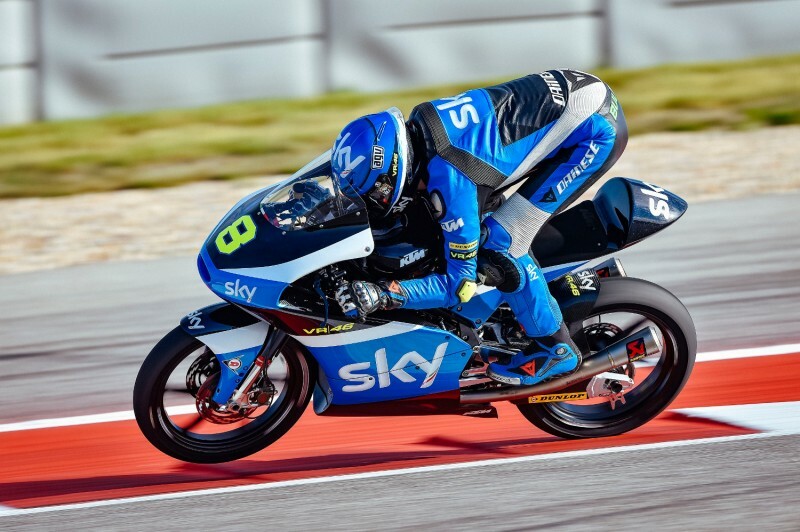 But a word of caution: In 2012 they crowned Bulega’s current teammate Romano Fenati with the same moniker after winning his second Grand Prix. Four years on and Fenati has still not progressed any further than Moto3. It’s now the Thursday before race day at the paddock in Assen. Nathalie Gina Bulega cannot look away from the TV screen in the hospitality lounge of the VR46 team. Rolling in front of her eyes is a live interview with her son from the television truck of the pay TV broadcaster and team sponsor Sky, which is parked at the other end of the paddock. A bit shy, with his arms crossed, Nicolò sits and politely answers the questions of the Sky interviewer. A proud smile works its way across mom’s lips. Before long, she comes over to join us at our table. Born in Germany, Nathalie Gina grew up in Berlin before her parents moved to Italy. We took advantage of her German-speaking skills to ask her a few questions. So, Mrs. Bulega, what was little Nicolò like? 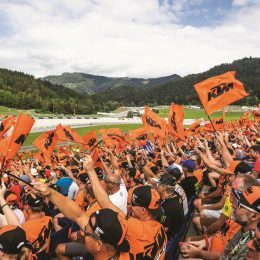 “He was a little devil,” she said, before going on to explain how her husband – the ex-250cc world championship rider Davide Bulega – first put eight-month-old Nicolò on top of an electric tricycle. Despite not being able to walk, he soon found the throttle and launched his trusty steed straight into the living room wall. Bang. 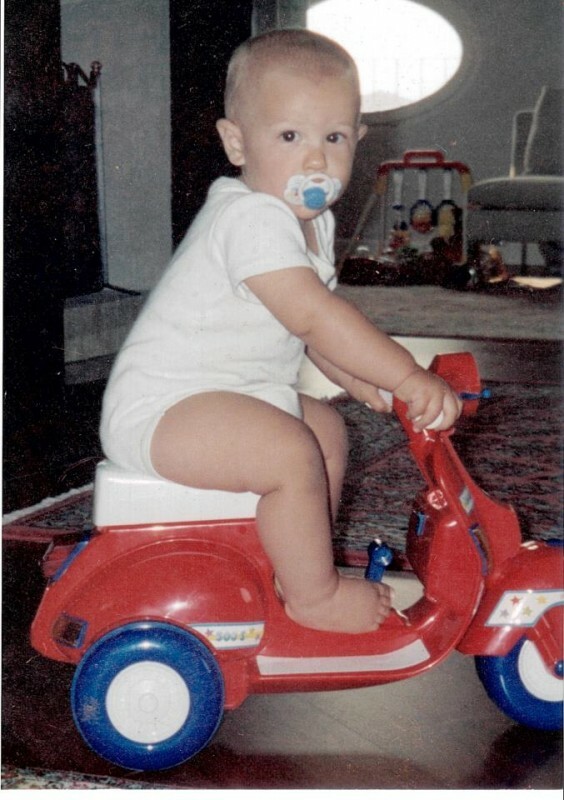 Mom turned the tricycle around, and Nicolò was back on the gas as he ploughed straight into the opposite wall. Bang. And so it continued for hours. Other mothers would feed their children by pretending the spoon of baby food was an airplane coming in to land in the youngster’s mouth. Mama Bulega twisted Nicolò’s right hand as if he were twisting the throttle – as Nicolò happily ate his food. Suddenly the sliding door to the hospitality suite opens and in walks Nicolò to join us. No, he says firmly, his parents never forced him to do anything. It was he who was constantly seeking out the saddle. Since leaving school at the earliest opportunity last year, his life has been all about racing. Eighteen Grand Prix weekends punctuated by four weekly sessions of strength and endurance training lasting four hours each. Test drives. PR events. Training with team boss Valentino Rossi and other young riders from Rossi’s Riders Academy at the organization’s flat track in nearby Tavullia. English lessons at the Riders Academy. How is anyone meant to find any time left over for a life outside of motorsport? “Yeah, I suppose …” says Nicolò, admitting that his circle of friends is largely made up of fellow racers. That Nicolò rides in Rossi’s VR46 team is no surprise. 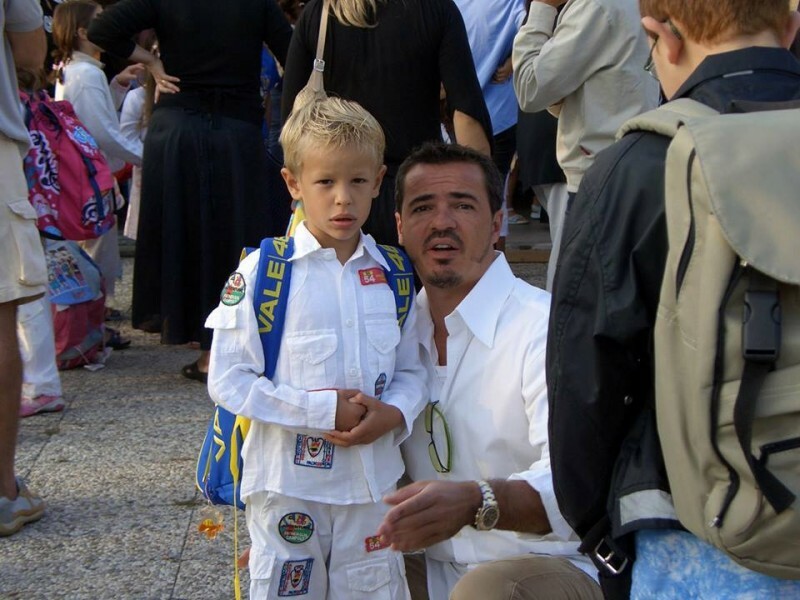 On his first day of school he marched through the doors sporting a Valentino Rossi schoolbag. A few years later he spent two hours hanging around outside Rossi’s motorhome at the Mugello Grand Prix until the master himself came out for a photo. And in 2013, after Nicolò had worked his way to the top of several youth classes, it was Rossi’s father Graziano who invited him to Rossi’s flat track. That this was a trial there can be no doubt. As Valentino looked on and saw how quickly young Nicolò flew through the bends, the foundation of their future relationship had been set.